FIFA is back with FIFA 17, where there is a lot to talk about. A new engine, new gameplay elements and what not seem to be the main talking points when the game was officially announced. First off, lets talk about the Frostbite engine that has taken over from the previous Ignite engine. I keep getting asked if the new engine has changed the series massively and in all honestly, it has and it hasn’t. Graphically it has, especially up close with kits and player faces detail looking much smoother and realistic compared to the weird and awkward looking player models that we used to get from the Ignite engine. While player faces look better in FIFA 17, they still have a odd ‘clay’ look to them that lack the amount of detail seen in PES 2017’s player faces. They’re better this year, but still in need of improvement. From a visual gameplay-cam standpoint, it has slightly been improved with better lighting and more detail, but nothing major this year. It still looks very familiar to what we have seen previously in the series. Saying that, we have to remember that this is a new engine and once the dev team at EA get to grips with the potential that’s on offer by the Frostbite engine for the FIFA series, I’m sure it’s going to be a massive leap forward for the series in terms of what they can get from it. Give it a year or two and I am very confident that we’ll see massive improvements in the series in most of the graphical and gameplay elements. From a gameplay perspective, FIFA 17 has seen a variety of changes this time round. Let’s start off with something that EA are calling ‘Set Piece Rewrite’. Essentially they’ve completely changed the systems for penalties, free kicks and corners, which are all totally different to how they were before and to be honest, while I actually like the new style ’target marker’ that you can aim anywhere for corners, the penalties and free-kicks felt broken to me. Maybe it’s because I’ve not learned the system as of yet, but there doesn’t seem to be any kid of on-screen feedback to show and to help you learn how to take either penalties or free-kicks. I had a penalty while playing The Journey mode (more on that later) and it was quite possibly the worst penalty I’ve ever taken since I’ve been playing football games. I’m hoping with practice, that the new system will be easier to understand. As well as changes to the set-piece systems, the main gameplay elements have seen overhauls this year including the AI system. One thing I did notice straight away from playing against the AI is that the players move better and make instinctive runs and seem to be more intelligent than what they used to be in previous FIFA titles. Last year for example, players wouldn’t react realistically and waiting for players to make decisive runs to create attacking options for you just wouldn’t happen frequently enough. In FIFA 17, this was mainly eradicated from what I played. The biggest criticism I have with the gameplay against the AI within FIFA 17 is that it feels so rigid and all the teams still feel very generic. It seems to be that no matter who you play, they all play similar to the next team. Be it Everton or Real Madrid. This is a little frustrating considering FIFA 17’s rival in PES 2017 has a system that makes each team play differently depending on their playing styles. The playing styles of teams has been improved since FIFA 16, but its still not on the level that we all want. A team that resides in League 2 shouldn’t be playing football like Barcelona or Bayern Munich. While I had issues with the playing styles of teams, I still enjoyed the gameplay thanks to the improved ball physics and like I mentioned above, the new attacking options that your AI teammates offer you. It’s just a shame that team differences are very limited again in FIFA. Physical play has been given a new lick of paint as well with new trapping and a 360 shield dribble. The new trapping system can be used to create space both defensively and offensively. Battling for position of the ball now becomes like a game of chess. You can use it to help make more attacking options like giving time for teammates with overlapping runs or use it from a defensive standpoint like stopping a rushing attacker getting to the ball. It all worked well with the short amount of time I had with it. As for the 360 shield dribble, this now gives you the option to shield out defenders whilst dribbling in any direction and while I personally didn’t have any major issue with it while playing offline, my first concern is that online could become as frustrating as an Arsenal fan waiting for Wenger to get the chequebook out during a transfer window if its used too much. Shooting felt good with the new ball physics working in tandem to make it feel more realistic than ever before. New downward headers, low driven shots (which were done by hitting square once to shoot and then again as you’re about to connect with the ball) and through balls that can now be hit with power that uses the same ‘Passing With Purpose’ system that was introduced previously worked well without any problems occurring from my time with the game. FIFA 17 is a different kind of beast compared to what was released before now. While on the surface it may look very similar, there is a lot inside the game that will take time to learn and adapt to. During my time with FIFA 17 with EA at Gamescom, I had the opportunity of playing the full version of The Journey mode that sees you take control of Alex Hunter. I don’t want to talk about how it starts and where I got to with my time with the mode as it will spoil far too much for those that don’t want to know anything. However, I will say that I enjoyed my time with the mode. Yes, its cheesy in terms of its writing, but I wasn’t really expecting a Oscar winning writer to come in and take the reigns. It has got its own unique style and I can see it being a very popular mode as long as the longevity is there. This type of mode has been extremely popular within the NBA 2K series in the past and it’s clear that EA want a piece of the action in that regard. It will be interesting to see where they go with it in FIFA 18. All in all, FIFA 17 is an enjoyable experience and while it may not have the Frostbite engine running all cylinders right now, I still enjoyed my time with the game. The last FIFA title I really enjoyed was FIFA 14, so for me to be as positive as I am with FIFA 17 shows the progression for the series. Will it take the crown as the best football game come September? Who know as PES 2017 is a fantastic title that it is going up against. All I know is from what I played at Gamescom, we have two football games that may have different philosophies, yet ultimately, both play a great game of football for different reasons. the playing style, the tactics, the formations, the career mode, the ai is the same as always and miles away from pes! they are using to much time on their ultimate money mode!! frustrating!! Where is the fifa17 review of fifasoccerblog? Only preview? 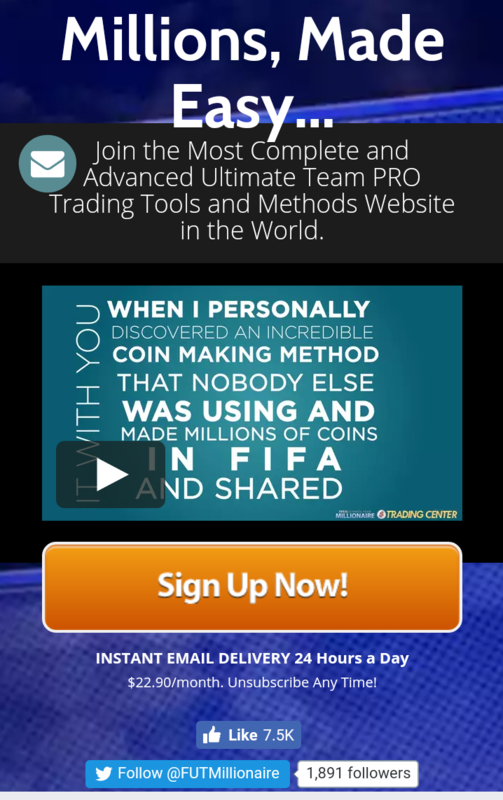 Join the Most Complete and Advanced Ultimate Team PRO Trading Tools and Methods Website in the World. Click the link to get started. The game is quite great and interesting, just played it of recent too. Hello There. I discovered your blog the usage of google. That is a very neatly written article. I’ll make certain to bookmark it and revisit to learn extra of the useful info. Many thanks to the post. no more updates on FIFA 18?